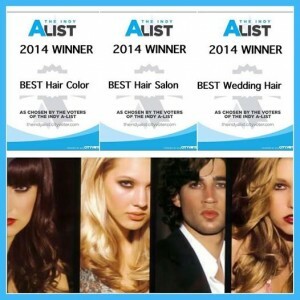 G Michael Salon is named the BEST Hair Salon in Indianapolis, Indiana for 2014. Every June in Indianapolis produces the biggest and most popular “Best of’ competition known as the Indy A-List. The Indy A-List features more than 5,683 businesses competing and is based on more than 103,000 votes from local experts. A few of the 158 categories that local businesses are hoping to be named the “Best of’ in are; Arts & Entertainment, Fashion, Shopping, Beauty and Wellness, Fitness, Cheap Eats, Great Meals, Home and Garden, Nightlife, Specialty Food and Drink, Auto, Pets and Weddings. In the Beauty and Wellness category, G Michael Salon wins in three categories including; BEST Hair Color, BEST Wedding Hair & Makeup and the biggest title of them all, BEST Indianapolis Hair Salon. This is the third year in a row that G Michael Salon has won the coveted title of BEST hair salon in Indy. We are so thankful for all of the support that we continuously receive from the community and are on cloud 9 with the news of these wins! Thank you for all of the votes that we received and we look forward to always providing top notch service to all of our guests!